Editor’s note: This story was updated on March 28, 2013 with a response from Dewar’s. 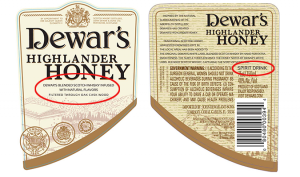 March 22, 2013 – After originally signing off on Bacardi’s plans to market a honey-flavored Dewar’s expression in the U.S. market, the Scotch Whisky Association has now changed course and is raising objections to the labeling for Dewar’s Highlander Honey. As was first reported on March 15, the Dewar’s expression will contain Dewar’s White Label Blended Scotch Whisky infused with honey from farms near the Aberfeldy Distillery in the Scottish Highlands. Scottish law bans the use of flavoring agents in Scotch Whisky, however, they are allowed to be used in whisky-based liqueurs and so-called “spirit drinks”. These drinks are sold in the U.S. as “whisky specialty” products under the Treasury Department’s Tax & Trade Bureau regulations. 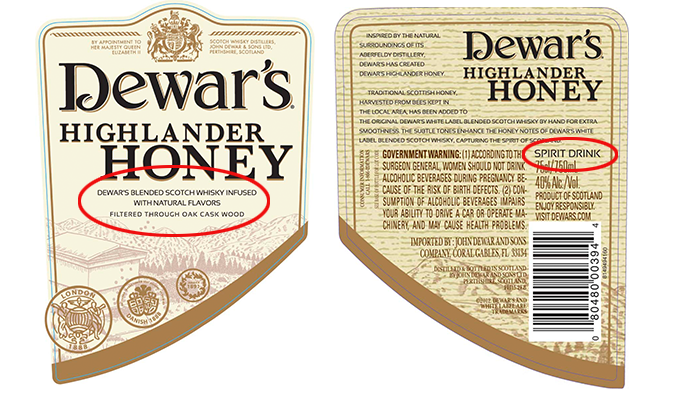 The label only refers to “Spirit Drink” in one spot on the rear label, while the front label makes no reference to it and only refers to “Dewar’s Blended Scotch Whisky”. However, it should be noted that the U.S. traditionally defers to Scotland on questions over Scotch Whisky. Scotland, Ireland, and Canada are the only nations allowed by US law to set their own standards for whiskies produced in those countries and sold in the U.S. market.